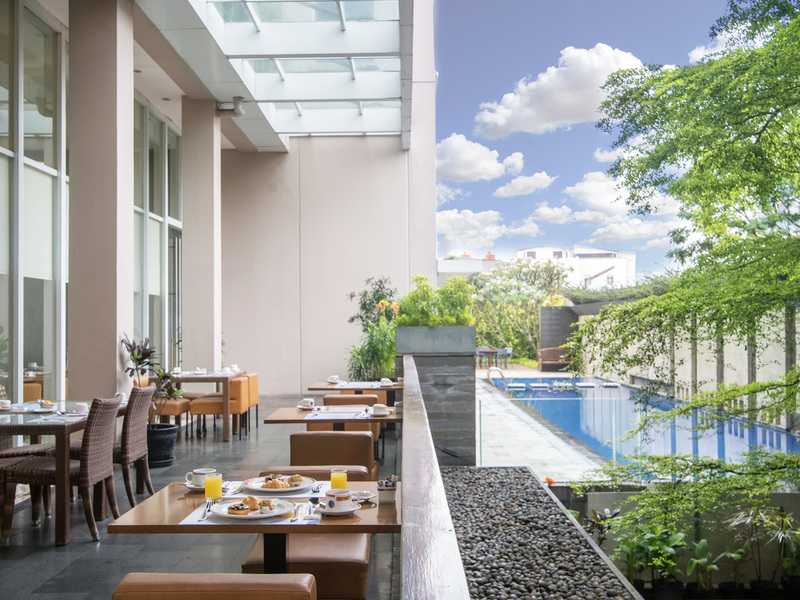 The best business hotel in town, Novotel Bandung is the answer. Explore colonial streets and building around Bandung such as Satay Building and Braga Street. Enjoy a day of shopping in Cihampelas street and enjoy fresh air in the parks nearby. The Square is a new dining experience concept serving authentic Indonesian, Asian and Western specialities. Open for breakfast, lunch and dinner, this restaurant offers extensive buffet and a la carte options. Our Lounge Bar provides an intimate and friendly environment where guests can enjoy a wide variety of exotic cocktails, mocktails in addition to other beverages and light snacks. Overall the services were good. Need more light in the room, it was a bit dark. And also the wall in the bathroom need some renovations. Very comfortable stay and everything was quite smooth. In this visit, I stayed at 1118 for 4 nights. Although I didn't have any problem with your hotel's basic services during my stay, I feel disappointed since the very first moment I had an interaction with your front office staff (during check-in) which affected my whole experience. Upon arrival, the Front Office staff who checked me in told me that the room for me was upgraded to Executive Room, and because of that, I won't get breakfast during my stay. In my opinion, it was strange not to provide me breakfast because I got an upgrade, because for a Platinum member like me, (please, correct me if I'm wrong) breakfast is a basic privilege that the Accor hotels will offer under any circumstances, while room upgrade is provided based on availability. So, breakfast and room upgrade are two different things. However, I didn't ask anything or argue with her during the check-in process because (1) I just had a very tiring business trip in Japan, plus an exhausting flight that had forced me to sleep less, so I was very very tired. I didn't have enough energy to ask, even if the front desk staff said &quot;1+1=5&quot;, I would've agreed, (2) When she said that the breakfast was not provided because of the upgrade, I thought that the Executive Room at Novotel Bandung was something really special. However, when I entered 1118 and really had a look at the room, I couldn't say anything special about what-so-called the Executive Room. In my opinion, the room 1118 was pretty basic (for Novotel standard worldwide). I have stayed at Novotel Bandung several times and experienced different rooms at different floors. And I am sure that 1118 is not significantly different from the non-Executive room. It is more spacious a bit, but that's it. I can tell that 1118 is even older than the 418 (the room where I stayed on December 2018). And now, I am wondering how Novotel Bandung appreciates its Platinum member by eliminating breakfast as an exchange for that kind of basic room called as Executive Room. Please don't get me wrong. I am not obsessed for having breakfast at the hotel's restaurant (During this stay, I went to good food stalls like Kupat Tahu Gempol or Mak Eha for my breakfast, and I don't mind it). So, the problem is not the breakfast itself. I just don't feel that the what-so-called Executive Room is worth the breakfast. It's not an apple-to-apple compensation, so it's not a fair exchange. Another issue was that upon arrival the Front Office staff didn't ask/offer me to make some deposit. On my first night, around 10pm, I ordered a room service (as always), I chose pasta (a recommended menu by the restaurant's chef) for my late dinner. When the food was delivered to my room, as usual I asked the 90.700 bill to be charged into my room account so that I could pay it when I checked out. After I finished my pasta (which was not tasty at all, to be honest - although I was hungry at that time), I quickly went to bed and tried to get some sleep. Just when I was about to close my eyes, the room phone rang - the restaurant called me and said that I couldn't use a room charge. I had to pay the meal by cash, because I didn't have any deposit on my room account. I was really disturbed and angry by that call. When the restaurant staff went back to my room, I gave him the money - and he said that he needed to go downstairs and would come back to my room to give me the change. So, I had to wait for him to go downstairs, take care of the payment, get the change, and go back upstairs to my room - which would take at least 15 minutes. That's when I yelled at him, said to him to just keep the change, and slammed the door. I understand that the restaurant could not accommodate a room charge for the room service if the guest does not have a room deposit. So, I am not blaming the restaurant staff. What I am asking is, why the FO staff didn't ask or offer me to put some deposit (as usual) during the check-in process? Don't you want the guests to cross-buy other services offered by the hotel? Doesn't Novotel Bandung have a what-to-ask/do list for the front staff when serving a checking-in or checking-out guests? I have been a regular guest for Novotel brands worldwide. In 2018 only, I spent more than 20 days staying at Novotel Bandung (12 of them were reserved under my name). I think Novotel Bandung is basically a good hotel in terms of location and quality of rooms/physical facilities. But based on my last two experiences here, the biggest problems Novotel Bandung has were related to the human issue; the staff. Especially the front office staff at the reception desk. I feel that the staff here don't follow (or don't have) an effective work system that guides them to perform their job that meet the Novotel's standard worldwide. After I experienced some disappointments on my previous stay at Novotel Bandung (12 nights, 12-28 Dec 2018) which I've already addressed on my review on TripAdvisor, I was actually doubtful to make reservation again at Novotel Bandung for this trip. But, I decided to give Novotel Bandung a second chance. And I ended up experiencing another disappointment. Now I am not sure whether I want to do it anymore. Nice clean rooms. Very friendly & courteous staff. Good location. Strategic place, very comfortable room, delicious foods, friendly staff. Highly recommended. happy to interaction with your front desk staff and restaurant staff. We are very convertable staying with Novotel Cihampelas. They upgraded my room to executive room, what a nice gesture. For this reason, I gave them an extremely satisfied rating. Clean, well maintained hotel room. great breakfast. friendly and helpful staff. Thanks for upgrading my room to executive deluxe. Really love the room and amenities also. I always had good experience also with room service. I ordered nasi timbel. Can I suggest u to change nasi putih into nasi merah? Nowadays many hotel serve nasi merah. Unfortunately your breakfast not improve yet, the quality especially.